High School/College Summer Camp 2019…a sleepover camp for teens who have finished their freshman year of high school, up thru those who are between high school and college. Our Sleepover Camp’s location for 2019 is CSUN! Our camp is located on the campus of Cal State Northridge! The campus is attractive, the living quarters are spacious, there’s air conditioning everywhere (except outdoors), there are two swimming pools, the food is super…what’s not to like? This isn’t your ordinary camp. It’s just not. There are no canoes. There are no cabins. We have showers. People cook for us. We might make something out of macaroni, but it’s doubtful. Who can come: students who have completed their freshman year of high school, up through students who have completed their senior year. (We also welcome adults who work with those students!) All levels of experience are welcome–from zero to lots. Doesn’t matter whether you’re on a ComedySportz High School League® team or not. Here’s what we are: the best camp for improv training if you’re a high school student or an educator who works with theatre students. You’re going to laugh a lot. Not a little — a lot. You’ll walk away with skills that will benefit you your entire life: trust, confidence, creative problem solving, teamwork, focus and the ability to turn challenges into gold. Simply, improv skills are essential for any actor, but also for anyone who wants to succeed. 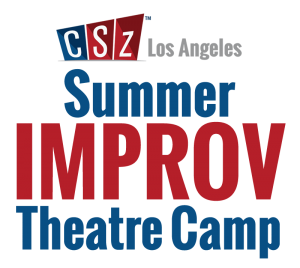 Past workshops have included: improv games, dramatic improv, musical improv, Shakespearean improv, stage combat, writing comedy for late night talk shows, writing comedy for the Web, commercial auditioning, puppeteering and more! Be sure to check out the scholarships available which can lower your fee as much as $100. You can also get discounts for early registration and/or for bringing along some friends from your school. Educators willing to assist our counselors can also attend at a lower rate. Be sure to click the Read More Option on the Registration icon below for more details on Camp Dates, Scholarships, and other info!